We believe that each person has a designer inside them and our mission is to turn their dreams and ideas to a reality, in which they can live in, because a happy life starts from a beautiful home! We’re a locally owned and nationally ranked remodeling company that can modernize your living space, no matter what size or scope of renovation you’re looking for. Kim Bailey Interiors is an award winning premier full‐service Interior Design firm specializing in high‐end interiors and furnishings, including kitchen and bath remodeling. As the Lead Designer, Kim Bailey combines her passion and creativity with her exceptional project management skills to bring turnkey and efficient design services to her clients. KBI has been awarded Best of Houzz in 2015, 2016, 2017 & 2018, as well as being recognized as one of Dallas’ Top Ten Design firms since 2015. They have been featured in numerous national publications including Architectural Digest, Kitchen Bath Trends, Kitchen and Bath Design News, and The Tile Shop. Kim prides herself that the firm is a customer service‐oriented organization with the ability to deliver top quality designs and implementation to ensure that the final results exceed the initial vision. Some of our client feedback has included "Kim and Lauren give professionalism a new definition and yet working with them was relaxed and actually fun;" "Kim and Lauren were with us every step of the remodel and their eye to detail was unsurpassed;" "KBI surpassed all my expectations!!!" Kim is a Professional member of the Interior Design Society (IDS), as well as a member of the National Kitchen and Bath Association (NKBA). Kim has also served as Treasurer for the IDS DFW chapter board in 2015 & 2016. Kim is a Partner with the North Texas Design Group, which enables KBI to bring hundreds of exclusive and custom furnishing to our client projects. Kim’s daughter Lauren is a Design Associate with the firm. Lauren is an Associate member of the Interior Design Society (IDS). As a mother‐daughter design team, KBI brings a very unique distinction to the design field. A specialization that also sets us apart is utilizing 3D design to communicate the vision to our clients. Together, they enable their clients to live or work in a space that goes beyond expectations. They leave room for each client’s history, personality, and lifestyle in the completion of every project. Each project is unique and special, just like their clients. Curb Appeal Renovations is a design/build remodeling company. They are owned and operated by a husband and wife team who have a direct hands on approach in all aspects of their business. DeVos Custom Woodworking is a family business. Our shop is located just outside Austin, Texas. We have been designing and building custom furniture and counter tops for over 18 years. StarFloors prides itself on providing the ultimate flooring experience for our clients. We’ve built our reputation on dependability, fair pricing, superior materials and workmanship. The Kitchen Source will guide you through the often-overwhelming kitchen remodeling or kitchen design process. We want to save you valuable time and energy and get you into your dream kitchen sooner. $1000 off a Kitchen or Bathroom Reno! JC Custom Remodeling is a full service contracting company for all of your kitchen and bathroom remodeling and home additions with over 18 years of experience. Royal Renovations provides home remodeling and room additions of unique beauty, personalized to your taste and completed with exquisite craftsmanship. Our custom design service includes a design expert working alongside you to plan the perfect kitchen remodel, bathroom remodel or complete renovation, and the result is a stunning and seamless transformation of your space. Whether you have design ideas for a fully renovated kitchen, or you want to realize your dreams of building a custom workshop, our remodeling experts will work within your budget to help design and create lasting beauty and functionality. Call us at (972) 810-7313 today to schedule a free estimate for your home remodeling project in Dallas! Interior Design Services are our pride. We hold fast to time-honored traditions of uncompromising customer service and high quality workmanship, while staying up-to-date with the latest tools and technology to produce efficient and exceptional results. We can provide custom-fit natural stone countertops and custom wood cabinetry as part of our complete kitchen and bathroom remodeling, and we also offer tile and hardwood flooring, faucets and fixtures. Our design team will help you transform any interior space! Ever dream of improving the exterior of your home? The construction professionals at Royal Renovations build custom room additions, garages, detached shops, mother-in-law ad-ons and more. We even install quality fencing and build beautiful decks for you to better enjoy in your yard! Whether your home improvement need is a bathroom remodel, complete kitchen makeover, new wood shop or backyard deck, the home remodeling team at Royal Renovations has the skill and experience you can count on for a job well done. Feel free to reach out to us, we would love to hear from you! KB Interiors, LLC has over 15 years experience in kitchen and bath remodeling and new construction, so we really mean it when we say we're here to help you. 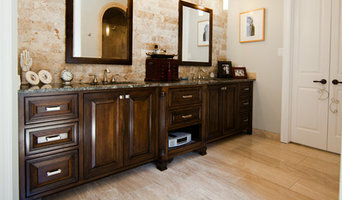 Dallas Kitchen and Bath Designer - 4X Best Of Houzz Winner! With more than 10 years of experience, we are committed to providing quality designs that are value based. We design with fresh ideas that include the latest technology and design concepts. Combining the professional quality of a large company with the personal service of a family-owned craft, we have built Joseph & Berry in order to provide no less than top quality performance. The Thaddeus Drew family has proudly served the North Dallas area with quality home remodels for decades, and our dedication shows. As full-service remodelers, no job is too large and no dream too big for our team. We excel at managing complex projects from beginning to end with tireless attention to perfection. We take the time to get to know your goals, and we take equal care in carrying them out so that you as the homeowner can relax during renovation. We complete our projects on time and on budget. You are in good hands. Our family’s legacy is creating beautiful spaces for your family to love. Our designers specialize in creating kitchen spaces with a distinctive look and functionality that reflects you and your family as well as how you live and use your kitchen. Not only do we staff our own jobs, but we also offer an in house designer included in your remodel to help your dream become a reality! For complete commercial and residential remodeling, siding, and window services, you can count on Marshall Construction to make your dream a reality.